Three texts on the long and problematic development process of Jean-Luc Godard’s 2006 exhibition at Pompidou. Translated for the exhibition of Godard’s maquettes at Miguel Abreu Gallery, Memories of Utopia, January–March 2018. ‘At the Pompidou, What They Love is Dead People’, interview with Philippe Lançon, Libération, 2006). The looser the connection in the sequence of events or the development of the action, the more the shattered image becomes an allegorical seal. Even from the visual point of view the sudden evanescent images of the cinema come to resemble a sort of script. The images are seized but not contemplated. It was in 2003 that conversations between Jean-Luc Godard and the Centre Pompidou began. The initial proposal was based around monthly events over quite a long period (nine months), where films would be shown, made up of news images and cinematographic images of the past. The schedule sketched out at this time allowed one week for the ‘gathering’ of images, fifteen days for editing, with the film shown at the Centre Pompidou during the fourth week. This would have entailed a sort of series: as they were created, each of the ‘shows’ would be enriched by its relation to the preceding ‘shows’. The exhibition was therefore constituted of nine monthly events at which visitors would be invited to discover a new opus. Correspondence with the film-maker began, and the development of this epistolary reflection led to the principle of an ‘exhibition of cinema’. At the start of 2005 JLG put forward some rough sketches for the occupation of the 1,100m2 space of the south gallery of the Centre Pompidou. Then finally during spring-summer 2005, the idea took shape of constructing a maquette that would allow the occupation of the space to be envisioned more fully. At the beginning of fall 2005 a scale model maquette was developed—manually made by the film-maker—representing nine rooms which ‘exhibited’ a thinking of cinema (in cinema…) by way of moving through memory (whence the notion of archaeology). This maquette prefigured a concrete scenography, but also provided a critical point of view on the very idea of exhibiting cinema. Following more in-depth discussions with the architect-scenographer Nathalie Crinière, a financial evaluation made it clear that the budget fixed by the Centre Pompidou for this exhibition would not be sufficient. At the end of January 2006, Godard was therefore forced to go back to the drawing board, and was faced with abandoning any full-scale realisation of the maquette. Nevertheless, at the time of writing, the maquette is still at the heart of the exhibition, even if it has had to undergo an adaptation and to take on a final form that will best allow it to be contemplated, branched figuratively across a number of rooms. These rooms are to be so many echos, so many screens receiving the irradiative effects of a lively thought, not the least part of which is the importance it places upon interrogating the act of image reproduction. At present I do not know what the definitive outcome of Godard’s reflection and decisions will be. In what follow, however, I would like to maintain the legitimacy of his project—and to do so on the basis of the maquette that he made. These lines therefore give only my own interpretation of the initial project, in the service of which I corresponded and worked with the film-maker for many months. 1. At the outset, the project, then entitled Collage(s) de France, archéologie du cinéma d’après JLG [Collage(s) of France: Archaeology of Cinema According to JLG]), was made up of nine rooms, with a fixed route through them. Each room was an invitation to the visitor to partake in a reflection of a poetic and philosophical nature, made possible by a generalized approach of bringing together and montaging images borrowed from art history, the history of cinema, and current affairs—a sort of rebus principle, perhaps. A few years ago, Godard wished to give a course at the Collège de France in which he would bring together the history of cinema and the history of the twentieth century—an essential part of Histoire(s) du cinéma. But this was not possible. Can this impossibility be explained, today, by the insufficient consideration given to the cinematographic art in comparison to other artistic disciplines? It would be all the more difficult to introduce cinema into the Collège de France in that the course would have proposed cinema as a reverse shot or counter-field [contrechamp] to those disciplines whose purpose was also to clarify historical processes: sociology, anthropology, and the discipline of history proper…. The initial title of the exhibition reflected this lost opportunity—collage/collège—but was also a reference to collage in the proper sense, to the scissors and glue used by the film-maker in his preparatory maquettes. It was a restatement of the dynamic of the bringing together of images, and in particular images that a priori do not seem destined to be seen together, opposed or compared to each other. In this point I think of the great master Robert Bresson: ‘Bring together things that have not yet been brought together and did not seem predisposed to be so’. Godard’s intervention into the museum took place at a moment in his career when his works were not attracting the audience of his first films, and yet the film maker’s own name was more cited and celebrated than ever. This apparent contradiction can be explained by the waning acceptance of films that manage to articulate critical exigency and a capacity for entertainment. À bout de souffle, Le Mépris, and Pierrot le fou were ideal marriages of theoretical force and a certain lyricism of the spectacle. After classical cinema, overwhelmingly dominated by the institution and scenic conventions imposed by Hollywood, met with a decisive challenge during the sixties which would mark out modern cinema, this association of critique and spectacle would in turn meet with a comparable crisis at the turn of the nineties. 2. Also in the nineties, the film-maker was repeatedly invited to design an exhibition or, more vaguely, to intervene in the museum space. Whether deliberately or not, the exhibition project he conceived during 2005 and 2006 was not without some distant kinship to the museum created by Henri Langlois at the Palais de Chaillot in the seventies. It features a similar decision to bring together the material artefacts and the immaterial memories of cinema. Langlois unhesitatingly brought together real objects of cinema (cameras, props, costumes), traces of its economic reality and media manifestations (photos, posters, contracts), materials testimonies to the process of film making (scripts, storyboards, maquettes…), lyrical and nostalgic evocations (reproductions of film frames, scale models of sets, fantastical set designs)…. No doubt such choices would explain why the principle of reproduction can be seen at work in the Musée Langlois as in Collage(s) de France. In the latter, duplications of pictorial works, agency photos, literary extracts were all related to the same principle of reproduction. In this way cinema compares itself to other forms of image production in light of the same status, a sort of common denominator—that which the exhibition of cinema demands—leading to an interrogation of the very functioning of cinema. 3. The unprecedented character of this exhibition project lay in part in its environmental allure, which might at first sight evoke the film set, usually reconstructed in the studio. Already in Passion Godard had taken the risk of doing this, but this is a different matter altogether. Through the use of space, a temporal process was to be described, that of thought itself. As they walked through the exhibition, the visitor was invited to reflect on the time-matter of cinema, that which visually incarnates thought in a film. As they walked the visitor would progressively rediscover the process of cinematographic conception: just as Maurice Denis said painting is a flat surface covered with colors assembled in a certain order, so a film is a set of durations assembled in a certain order. The visitor’s journey would therefore be the inverse of the film-maker’s: where the film-maker conceives in order to try and make something perceptible, the visitor must perceive in order to try and reconstruct the activity of conception. This explains the meaning of the titles given to each room: Myth (allegory), Humanity (the image), Camera (metaphor), Film(s) (duty/ies), Alliance (the unconscious, totem, taboo), Bastards (parable), The Real (dreaming), Murder (Sesame, Theorem, Montage), The Tomb (fable). The sequence of the rooms did not respect any didactic order designed to re-enact the creation of a film. Instead the visitor was confronted with a sort of huge puzzle that he had to solve mentally. Collage(s) de France was thus a theoretical environment, on the scale of a 1,100m2 exhibition hall, and using juxtaposed and mixed images and words. But there were also some original artworks, chosen by Godard, alongside the numerous reproductions, duplications, or reconstructions. Again the old master Bresson: ‘The mixture of true and false yields falsity (photographed theater or cinema). The false when it is homogeneous can yield truth (theater)’. It is not without a certain theoretical relish that the film-maker most associated with the challenging of theatrical clichés in postwar cinema proposes to the museum visitor an experience not lacking in theatrical accents. But in fact their effect is entirely other. It is a matter of a labyrinth, within which the author of Histoire(s) du cinéma accomplished in scenographic terms what he had previously operated through montage. It was no longer images that paraded past, but visitors. Remember that the parade of characters was already a way of comparing bodies in many films: For Ever Mozart, Grandeur et décadence d’un petit commerce, up to the mysterious On s’est tous défilé…. In fact, the visitor was invited to perceive otherwise the time of the conception of a film: the time of ‘materialization’ (to use JLG’s word), the time that passes between the phase of imagination and that of realisation, so as to arrive at the condensed time of the finished work, finally sorrowfully separated from its author and swallowed up by the tomb of diffusion and communication. 4. In the sixties, at the birth of the Nouvelle Vague, the most important set was the street. It opened up a new visual field, with the freedom of filming, sometimes with a handheld camera, a script that had thrown off any stifling narrative obligations: a lot of talking for not much story. In the sixties, at the end of the period whose video work is usually grouped together within Sonimage, following that marked by the phrase ‘Groupe Dziga Vertov’, dominantly experimental, the environment was no longer either landscape or urban—as if the experience of the street during the events of May ’68 had exhausted the flâneur JLG. It was fulfilled in the ‘manipulation’ of the video image, with films such as the lengthy televised series France tour détour deux enfants… or Numéro deux, with the determinative collaboration of Anne-Marie Miéville. The environment was the result of a graphical realisation of thought. During this period, the occupation of the screen became a sort of ‘page layout’, with screens proliferating within the screen. Graphism was increasingly at the heart of the image. But since the beginning of Godard’s work, typographic or handwritten text, with the whole screen occupied by arbitrary signs of a written text, often took over from the filmed real. Throughout the oeuvre the détournement of signage, press headlines, and urban posters expresses an intense attraction toward the graphic. The titles are all very remarkably composed. No doubt we should recall Godard’s interest in the Soviet film makers, the plastic force of whose images was as much a matter of graphic purpose as of realist or historical reconstitution. The eighties were the era of an apparently greater concern for ‘scenery’ in the traditional sense, and were also the period during which painting and choreography encountered one another—as in the great reconstructed paintings and the gesticulations of actors (Michel Piccoli and Isabelle Huppert) in Passion. The movement of bodies is essential to the films of this period (Prénom Carmen, Détective, King Lear), as if the hysterical forces of characters were set in opposition to, but also fused with, the strongly dominant pictorial shots. The paintings reconstructed as film sets, disturbed by the movement of actors and montage, became steps in Godard’s thinking. Finally, from the nineties to the most recent period, we must note a bias toward films that used ‘found sites’, strongly marked by a relatively grandiose architectural dimension, in accordance with the use of symphonic music—from the spaces of large hotels (Détective) to those of the destroyed library of Sarajevo (Notre musique). The sites in which shooting takes place, even those that are the most monumental, seem to have been fabricated for the needs of the film. This monumentality is bolstered further by music, the depth of the soundtrack (overlapping musical extracts, overlaid by noises, the layering of ambient sounds), and the volume level of sound. Sometimes sound unified the entire space: for example, at the time of the Nouvelle Vague as in Histoire(s) du cinéma, the croaking of a crow or a raven returns insistently. The cry feels like a mark affixed to the sets, a sonic tag that gives its signature to the image. This noise, bordering on the disagreeable, this sonorous scratch of a black bird, recalls the graphic mark of a black marker pen. Recall that Godard often worked with marker pens to make the title cards of his films. In this we must see a way of appropriating and signing an environment that is already there. Collage(s) de France instead absorbed the world into its own space. Past and present history were engulfed in the traversal of the exhibition; traces and testimonies accumulated, coming together, attracting each other, and adhering in a furious confrontation of images. Here it was not shooting that captured an environment, it was the environment that entered like a torrent, to be concentrated in the exhibition, ideally realised in several maquettes. The image is a pure creation of the mind, it cannot be born from a comparison, but comes from the bringing together of two distant realities. The more the connections between these realities are distanced and true, the stronger they get to be, the more it will have emotive power. Two realities that have no connection cannot be drawn together usefully. […] An image is not strong because it is brilliant or fantastic but because the association of ideas is decent and true. 5. Even if Godard himself is indifferent to it, we cannot approach his proposition without discussing a phenomenon that has characterised the milieu of the sixties and is of continuing importance today—that of the installation, ally and rival of the traditional plastic disciplines. The picture rail and its alignment of frames was thrown into crisis, or at least perturbed, by propositions where light had ceased to be mythically zenithal. The spectator was invited to move across the whole room, with no hierarchy between walls and floor. Installations were often defined by their use of found materials, materials that lacked nobility but which the museum endowed with the status of art. And the other characteristic of installations is the presence of moving images. Light rays disturbed the univocal meaning of the museum visit, and the projection of moving images contributed to the disorientation of the spectator. Reproduced found images, whether moving or not—the principles of the installation were effectively brought together in Godard’s exhibition proposal. But the film maker deplored ‘technical effects’ which, in his opinion, were too reliant on curiosity about the little machines exhibited. He felt no attraction to the ‘celibate’ in art, or to ‘desiring machines’. It was no doubt in order to deflect this machine-effect that he seemed, on the contrary, to privilege the environmental. The invitation to allow one’s attention to float would encourage the visitor to lose himself, turning his attention away from the machines necessary to project the images—thus rediscovering cinema, since in the movie theater ‘everything is done’ in order to forget where the images come from, in favour of the destiny of the characters they show. In the past, Godard actively commented on the conditions of film making by breaking with the imaginary investments of the viewer (breaks in the story, looks to camera, interruptions in music, non-linearity of events…). He often pointed out the cinematographic ‘machine’ and disillusioned the viewer, yet he was not above a certain lyricism. The brutal interruptions he makes in the musical excerpts, although they may not prevent the fictional constitution of his characters, certainly help to introduce a certain difference into it. Collage(s) de France perhaps more than ever, offers a total fusion between a spectacle and that which presided over its conception. 6. From the outset this exhibition project was related to the moral essay. But its environmental part simultaneously emitted the effects of a fiction whose main character was JLG himself. Or more exactly, his thought in movement, organised into the path through an exhibition. In a certain sense this might remind us of Eisenstein’s dream of filming Marx’s Capital, in other words of directing a kind of theorem…. Collage(s) de France was an invitation to an intimate journey permeable to the upheavals of the world. It is from the tension between these two poles—autobiographical fiction/inquiry—that poetry emerges. A poet like Victor Hugo married together intimate writing, political discourse, and moral essay. Les Châtiments, for example, are a poetic gesture in which this tension between ‘auto-fiction’ and judgment on the world is in play. It is no surprise, then, to find texts of Victor Hugo peppering the commentaries-off and dialogues of the films (Passion, For Ever Mozart, episode 3A of the Histoire(s) du cinéma with its protest against the war in Yugoslavia, and more besides…). Collage(s) de France was a response to a frequent criticism of the film maker: that he does not tell a story. On this subject, one day he humorously recalled the scolding he received as a child—‘Don’t tell tales’—and his present life as a film maker constantly asked by producers to do just that. In fact, he had always sought a balance between fiction and the ethical gesture. In his work the Goethe of Werther and the Mallarmé of Igitur, the political impetus of David and the scrupulous nominalism of Duchamp, are brought together. Undergoing the trial of the exhibition, the film maker told a story where it was the viewers who became the fictional characters, or the frames of a film which the strip would string together. This exhibition project extended the reflection of Histoire(s) du cinéman, where history was carried away alongside poetry and essay. 7. Each of the rooms had been conceived so that the viewer himself might make collages out of a forest of images. The visitor was therefore put to work, had to make the effort to assemble, had to do his ‘duties’ in the exhibition (to use the names of one room). Collage(s) de France was a utopia that would be unrealisable on film. This utopia sought a tempestuous balance between fiction and aesthetic and ethical judgment, between belief and the lesson taught. This utopian possibility of cinema was cinema making itself thought. Recall that JLG had always been interested in that which was divided. For example, in the first room we read: ‘Hollywood, the Mecca of cinema’. Hollywood is placed on the side of belief, faced on the opposite wall by the documentary image of an Algerian family. Fiction sings to the tune of belief, documentary to the tune of facts. From this division is born the theme of the character of the film maker divided between the project and its outcome, conception and perception, the exception and the rule… film and cinema. Soigne ta droite, Sauve qui peut (la vie), Prénom Carmen, Éloge de l’amour all tell of this division in their own way, and the exhibition becomes the utopian refuge for its resolution. But the film maker of Mépris and Passion also places himself in peril in this refuge: When he enters the museum, is he still a film maker? At the price of what renunciation or what detour can he continue to make films? Does cinema exist without films? 8. The division is elsewhere. On one side, the world of cinema, unconcerned by the fact that the film maker is now making an exhibition; on the other, the world of museums, troubled on the economic, aesthetic, and moral plane by the notion and the use of reproduction. And in this exhibition, reproduction was introduced into a place devoted to exhibiting non-reproducible originals, a place founded on authenticity and inalienability. On the other hand, what it wants to exhibit is stripped of all value. It is by way of reproduction that Jean-Luc Godard entered, paradoxically, into the museum. In fact, for a long time he had situated himself on an island between the world of the museum and that of cinema. He was an incarnation of the tense relation between cinema and the other arts. The exhibition project registered this tension by hanging from the museum’s lofty picture-rails the ontological given of the art of film, reproduction: a film is a recorded copy of the real; it is also a copy of a negative, and it is distributed via the duplication of copies. On every scales, therefore, the fact of reproduction is embedded in the cinematographic art. Collage(s) de France was the exhibition of reproduction, the very material of cinema. Photography, reportage, video, the photocopy, were all used, because, in effect, reproduction gives its testimony by enlarging and reducing, the change of format being another patent sign of the fact of reproduction. So the film maker enlarged, reduced, broke up, in other words he did the work of the art historian: he scrutinised and explained—but he also remained an editor, cutting up and reassembling otherwise. This is what authorizes reproduction. Supposing that we describe modern art, and more particularly the contemporary art of the last forty years, as a generalised procedure of recycling (Pablo Picasso and his collages, Marcel Duchamp and his readymade…). Then Jean-Luc Godard also proposes a new and exemplary demonstration of this in his films, through his generalised art of citation. At one time he dreamt of a film where everything would be taken from elsewhere; perhaps the exhibition Collage(s) de France made this dream come true. This experiment in reproduction exhibited at a museum may be just as shocking as at the cinema, where Jean-Luc Godard gave such an illusion of only imitating and critiquing. His art of reuse has been linked with his origins as a critic, but today, in his exhibition maquette, he unveils what, for him, was at stake in this reuse. By ‘exhibiting’, he comes close to André Malraux and his Imaginary Museum whose artworks, brought together by means of reproduction, could be compared—that is to say, very simply—could be viewed. The Possibility of Impossibility Passion, Soigne ta droite (Keep Your Right Up), For Ever Mozart, and Éloge de l’amour (In Praise of Love) all stage the laborious birthing of the artwork, which sometimes proves impossible. The figure of the filmmaker who cannot manage to make his film ends up blurring into that of the real Jean-Luc Godard. The first stage in a project, film, or exhibition is a difficult moment for him, as Suzanne Schiffman recounted when Alphaville was shooting: ‘The first three minutes of the film, Godard just could not do them. Each time, it was a leap in the dark. And then it was done, he’d made the leap.’1 At the Centre Pompidou, Godard never seems to have resolved himself to make the ‘salto mortale.’2 We have seen many e-mails that speak of his trepidation before the passage to the act. Always the same battle between vision and language: in Vivre sa vie it is Nana who asks Brice Parain whether it would be possible to live without talking, in King Lear Shakespeare Junior who wants to know ‘how to get to words without using words,’ while the voice of Godard/Professor Pluggy exclaims: ‘Show! Not tell!’ because verbal incontinence implies biological incontinence: ‘To name things makes the Professor pee.’ The interrogation of language runs through Godard’s entire oeuvre. It is the principal subject of Alphaville, where everything is reduced to naming, identifying, recording, deducing. You must never say ‘why’, only ‘because’. The denizens of Alphaville are sleepwalkers moving through a sleepless and desireless night. Like automata, they mechanically emit polite phrases, an absurd succession of undigested expressions. Speech harbors only emptiness. With the presence of the quavering voice of Natasha, who asks questions, doubt irrupts into the established order of Alphaville, a dead city suddenly traversed by a living language. Language also lies at the heart of Collages de France, in one of the rare rooms that remained almost entirely unchanged from start to finish. Room 5 (previously 7), successively named “Text (alliance)” (June 13, 2005), “The Unconscious (axiom)” (September 2005), “Axiom (the unconscious)” (October 20, 2005), and then, in the last version of the project, “Alliance (the unconscious Totem Taboo)” (November 28, 2005), exhibits the battle between text and image, by juxtaposing a number of sketches by Anne-Marie Miéville as a child with a series of texts gathered during her adult life. We see that an encounter is possible between images and words (figured by the various thaumotropes present in the room): ‘For her, the battle between image and text is over. As is that between memory and imagination.’ In this way Godard fabricates a space of pacification, where words and images find their way to reconciliation. As for the different titles given to the exhibition as a whole, they are formed by the modular coupling of a smaller number of terms. Godard hesitated for some time between ‘Collèges de France’ (with the subtitle ‘cinéma ex-posé’ or ‘dé-voilé’), ‘Collages de France’ (potentially with the subtitle ‘Le cinéma exposé,’ ‘Déposition du cinéma,’ or ‘Le cinéma: acte de dépôt’), and ‘Collage(s) de France’ (for a long time coupled with variations on ‘an archaeology of cinema according to JLG’), which would be the option ultimately selected for exhibition 1. The title ‘Never Godard’ [in English] also appears in contracts from around February 2006. When in 2004 he progressively abandoned the idea of an audiovisual work in the form of a course in favor of the construction of a set, Godard kept the name ‘Collages de France,’ proving how important this notion was to him regardless of what form it might take. He remained faithful to his initial idea for a title, as he would to ‘Voyage(s) en utopie’ for the second exhibition. The subtitle was slightly modified however: ‘Sur la piste d’un théorème perdu [On the trail of a lost theorem]’ became ‘À la recherche d’un théorème perdu [In search of a lost theorem].’ The pleasure Godard takes in his titles is evident throughout the whole production. His method of proceeding with a large series of modular titles is yet another a way of envisaging before doing, and testing all hypotheses. Maquette 1: made in one piece in Rolle by Jean-Luc Godard, filmed for Reportage amateur. Maquette 2: made by Godard, disassembled into separate pieces and exhibited across several rooms in Voyage(s) en utopie. Maquette 3: made by Nathaniel Crinière, left unfinished by Godard, presented in the exhibition near to the fenced-off space of room -2. Maquette 4: created especially for the exhibition, made by Jacques Gabel based on maquette 2 but on a larger scale, and shown in room -2. The maquette is the material support for the filmmaker’s thinking. He must visualize the miniaturized exhibition before it is realized, just as he must be able to see the screenplay before shooting: ‘I think that you see the world first, and then write it,’ as he says in Scénario du film ‘Passion’. And this is the purpose of the maquette: it is for seeing. It corresponds to the time of conception. The work on the maquette as it was envisaged before the construction of the set corresponds closely to Scénario du film ‘Passion’, in which Godard seeks with his palms in the canvas-screen. Prior to the passage to the miniaturized third dimension, this desire is satisfied via the medium of plans and designs: ‘It would be good if each room could be visualized as a computer simulation as the project went forward, before making maquettes.’7 The order for watercolors by the designer Yann le Béchec is meant to play a similar role. Having discovered le Béchec’s book on Sarajevo (some drawings from which he uses for room 6 of Collages de France, ‘The bastards’), Godard asked him for some views of the exhibition. As successful as they were, he declared them ‘unusable,’8 doubtless because he felt they did not fulfill their projective function. Neither was he satisfied with the enlargements of various details (materials, paintings, photographs) made by Centre Pompidou: ‘29/12/05: first ultra-late efforts (Daumier, Macke, Delacroix) seen at J. Gabel’s with N. Crinière—stupid and incompetent.’9 Only the maquette responds to his needs. Enlargement, which could have allowed people to sense the development of Godard’s theorem rather than just understanding it, seems to be of little interest to the film-maker. He prefers to keep his exhibition in the state of a petri dish that only he can look at. His Collages de France allow him to see Voyage(s) en utopie: they are the first production of images for it, a section of the screenplay. The definitive exhibition is a project that hardly exists in ‘written’ form, one whose preparatory documents are contained in a few plans and images. We should also remind ourselves of the presence of an enlarger in room -2, the space in the final exhibition where Collages de France is most in evidence, like a secret reference to the negative-exhibition that was never to see the light of day. A ‘Work of the Spirit’ Theoretically, the first maquettes were to act as three-dimensional sketches, but ultimately the Collages de France would not go beyond this scale (apart from a few objects used in Voyage(s) en utopie, such as the puppet-effigy of Jeanne Hébuterne). In the exchanges between Dominique Païni and Jean-Luc Godard the maquette and its use were a recurrent topic of discussion. In 2005, Godard suggested the construction of a 1:10 scale maquette that would be sold in kit form and could potentially be filmed. So the maquette is not at all a rough working sketch destined to be left behind; it is a work in itself, with a commercial value. However much he complained about it, the budget overrun that heralded the end of Collages de France allowed Godard to keep his first exhibition in a prototype state. Indeed, it is notable that, at the very moment when Jacques Gabel comes up with convincing solutions to save Collages de France, Godard decides to give it up. His remarks must be treated with caution, particularly when he states that within the final exhibition ‘all that is left over are the maquettes of a work, not the work itself.’15 Along the same lines, we read in Collages de France on the smallest of observations of the impossibility of entry: ‘all that remains today is a maquette,’ as if it were only a derisory remnant. Yet if we retrace every step in the construction of Collages de France, it is easy to see just how important they are, from the beginning of the project up to the moment of Voyage(s) en utopie, where the room called ‘The day before yesterday [Avant-hier]’ is dedicated to them. In a slightly later version, rather than rethinking his project, reducing its scale, and distributing the nine rooms differently, Godard decides to exhibit the maquettes in the corresponding rooms to which they could not be enlarged. This new spatial arrangement would have produced a play of scales between the objects, as would happen in the final exhibition, a constant dialogue between original and copy, miniature and enlargement. The electric train and the little maquette-boxes are so many objects whose growth was arrested at the stage of Collages de France. For some time the commissioner considered work on the maquette as a mere transitory phase, as attested to by many of his e-mails: ‘The succession of maquettes must not eternally defer the “leap.” The best maquette, the most convincing one, would be the one that could be deployed over 1,200m2!’17 He is concerned to make sure that Godard does not end up preferring the miniaturized exhibition to its transposition into the space, and finds it difficult, at this stage of the project (the beginning of fall 2005), to accept the idea that it could be kept at the smaller scale. But the filmmaker’s proposals have for some time been leaning toward reduction. Over the coming months Païni would have to resolve himself to welcome the maquettes as true works in themselves, and in the proposal that he writes with Nathalie Crinière in January 2006, he himself ends up placing them at the center of the project. Toward the end of 2005, a second version of the filming of maquette 2 was planned in the form of a medium-length film, but was finally abandoned. As well as suggesting a meticulous analysis, its title, Autopsie d’une exposition, also announces the impending death of the project. Reportage amateur is a precious source of information for our understanding of what binds the filmmaker to his object. 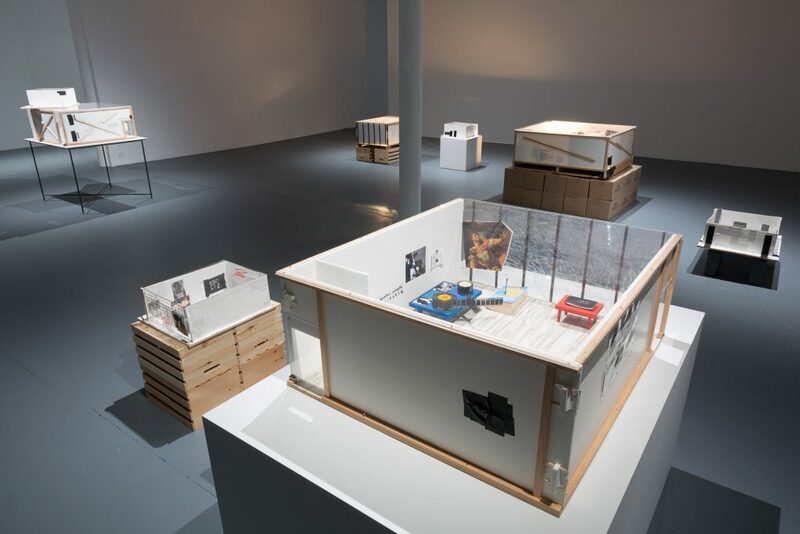 From above, Anne-Marie Miéville’s camera scans across the maquette of the exhibition, while Godard describes each room. In this very simple staging of the object, Godard stands over his creation with a certain jubilation. Like a model-maker, he comments (as a voice-off) on his work, walking his hand around the interior of the spaces he has composed. The image of the marveling little boy is overlaid with that of the teacher: for all we see of the filmmaker is his hand, extended by a little wooden ruler which points out each element as he exhibits his vision of the world. The interest of this reportage also resides in the filmmakers’ off-screen dialogue, another one of the ‘talks between two friends’ (Soft and Hard) they had filmed so often since working together and combining their voices, off (Le rapport Darty, The Old Place, Ici et ailleurs…). Certain brief allusions in Reportage amateur betray Godard’s relation to the institution: he lets slip a few ironic remarks, notably on the subject of the thaumatrope: ‘That was not well made at all, which is rather regrettable, because neither Fresnoy nor the Pompidou had studied the thing….’ Ann-Marie Miéville’s voice interrupts him immediately with a reproving ‘shhhh.’ She cuts him off or encourages him, sometimes discreetly giving her views on the material details. The maquette is filmed a second time in Souvenir d’utopie, made up of tighter, fixed shots, without commentary, intercalated with black. Made a few months apart, the two films have a very different status: one was supposed to be audiovisual documentation of a project ‘in the process of being made’ (or rather ‘in the process of unmaking itself’); the other records a completed miniaturized proposition. Souvenir d’utopie unfolds in a time and space that is now gone, at once a regretful look back at Collages de France (memory) and a reference to the upcoming exhibition (utopia). Unlike Reportage amateur, which was captured on the run in long takes and features just a few impromptu cuts as a result of accidents while shooting, the montage of Souvenir d’utopie is abrupt and rapid (more than forty-five shots in three minutes of film), and features only fixed images. The film presents the exhibition Collages de France chronologically, simulating a visitor’s path from ‘Myth’ to ‘Tomb.’ The titles of the rooms are absent, however, and it is left to the soundtrack to structure the space, signifying changes between rooms with a change in the mix (the soundtrack is made up of voices, music, and sounds). The sonorous material of each rooms is constructed autonomously, something that could not be realized in the life-sized exhibition, because the sound would bleed between the different spaces. The framing of the rooms in wide shots means there are no external reference points (the establishing shots and the shots of Godard’s hand serve as referents in Reportage amateur). It is an almost abstract visit to a Collages de France without scale, a fictional walk through an exhibition that one could almost believe had actually taken place. The Collages de France were destined to be erased, but their recording, unlike Voyage(s) en utopie, which Godard decided not to film, has saved them from being buried. The maquette remains the most important element to have survived Godard’s great museographical experiment at the Centre Pompidou. It is to Collages de France a little as Tatlin’s Tower is to his Monument to the 3rd International, designed to be realized in iron and glass, but existing only in the form of a wooden maquette: miniaturizations of a political or artistic utopia of which they remain the emblem. The ultimate fate of these ‘works of the spirit,’19 however, was contrary to the properly artistic dimension that should be their defining characteristic. Since the Centre Pompidou shows no interest in acquiring them, Godard makes the decision to gift them to Emmaüs.20 The rest of the exhibition is dispersed, with the Centre taking in the audiovisual material, Peripheria the objects and furniture elements. The sale is organized on December 3, 2007 (by strange coincidence, Godard’s birthday) in room 14 of the Druout auction house, before a few rare potential buyers and with no media coverage. In fact two sets of maquettes are listed (that is, two times nine rooms), the smallest having been made by Godard himself. They are bought by different buyers for sums between €400 and €800, bringing the sale total to €8,600. Ultimately it is just one private collector, Alfons Solans, who becomes the successful bidder for the whole lot, for the derisory sum of €11,000 (far from the €20,000 at which Godard evaluated each room of his construction). A price of an artisanal work, not a work of art. An €11,000 that signifies that we are not in the presence of a work here, but of mere remnants: paper, glue, and some electronics. Yet for all that, their artistic value does not seem to have been affected by this somewhat surreal ‘bargain basement’ sale. For their trajectory may well continue, with new projects for exhibitions in galleries or contemporary arts centers. Objects of discussion, objects of speculation, and finally objects of art, their existence endures beyond the vestiges of an aborted exhibition. From the start, it is understood that the Centre Pompidou will produce a work of which Godard will be the active subject, whatever its form. So it will not be a retrospective on a work seen from without, but a new body of research by the artist. The nature of the project changes noticeably from the beginning of exchanges between Jean-Luc Godard and Dominique Païni. The term ‘Collages de France’ appears in their correspondence from 2001. The first proposal, turned down by Godard, consists in his hanging the museum’s collection.21 To the second proposal for an exhibition, Godard responds with a series of courses organized as a television show. He circumvents the problem of the space, to utilize the tools familiar to him: images and time. But this first conception of Collages will be disappointed of its great hope: to make television, but to bring out its supposedly primary virtues, reminding it of its duty: to be not only a medium of transmission, but also a medium of expression. The filmmaker wants to occupy a space in the Centre (and not an already existing movie theatre), that is to say, to take over a museum space to exhibit time. This project extends both his thwarted televisual ambitions and his interrupted conferences in Montreal, by taking advantage of more suitable means. He reinvents his televisual utopia by conceiving of a sort of auteur television that would bring together in dialogue writers, philosophers, scientists, and artists. By juxtaposing these interviews with images taken from the news media or from archives, he seeks to propose a critical television productive of something other than forgetting. Païni also asks if he would agree to showing some of the paintings of his youth in the exhibition. Godard refuses this complementary project, preferring to concentrate on the televisual effort. These Collages de France would have been courses on cinema, televised programs, and documentaries. Along with various images already shot by Godard and news footage, he would have been able to include views of his own workplace. The intention was to install at Rolle a kind of equivalent of a ‘loft’, a ‘Star Academy’26 produced by Le Fresnoy, of which he would have been an (ir)regular performer. Numerous cameras were to have been installed in his studio, filming his workday continuously. As in the Peripheria project at Fémis and so many of his films, once more he would show the toil of the artist: ‘Not to show Bergson talking, but to show Bergson’s thought at work’ or ‘to show painting in-the-making,’27 as he explains on the cusp of the first Collages de France. This attentiveness to work, whether his own or that of others, would be a repeated gesture, as we have seen, over the course of his career. Looking at work, analyzing the gestures by which it is accomplished and ordered—this is a perspective that has always fuelled Godard’s problematics: the work of the cinema (Petites notes à propos du film Je vous salue Marie, Changer d’image, Le rapport Darty), the work of thought (Luttes en Italie, Vent d’est, La Chinoise), the work of business, of the factory (Comment ça va, 6×2),28 the work of love (Passion, Numéro 2)…. And yet, although they are sometimes of considerable duration (the long fixed shot of Godard and Miéville discussing their vocation in Soft and Hard, for example, or the interminable tracking shot of the factory in British Sounds), these different examples can only ever approach continuous time, without offering the full experience of it. A continuity of sport, of television, and of cinema—but also of the theatre, where Godard had planned to film Racine’s Bérénice, mixing views of the performance and rehearsals with the external life of actors and team, as well as audience and critics’ reception of the play. In all domains of a merged life and art, Godard sought to capture things as they happened, from the most banal to the most exceptional. Just like the humming of Marie Laforêt’s voice in L’Amore, time has to take its time. One must show all the hesitations, regrets, and errors in order to approach a certain justice: ‘Television films the starlet and her glory, not man and his misery.’33 It very much seems that the Collages de France project would have been closer to the work of Andy Warhol than to the productions of TV networks M6 or TF1, which create an artificial frame in which to exalt emptiness. Its reflexive reality TV would have shown both the filmmaker in the banality of his everyday life and in his exception as an artist. But this idea would be abandoned before any technical tests, and would remain one of the numerous preliminary strata of Voyage(s) en utopie. Each interview was to be preceded by a presentation, but Godard dispensed with these (apart from Païni’s, on the figure of the idiot in his films) and insisted on going directly to the discussion. By turns loquacious and silent, he served up various different fates for his interlocutors by making use of the link-up: in his interview with Dominique Païni, he plunges the studio into darkness, lit only by the meager gleam of a candle, like Goya’s old man in his exhibition.35 The low light causes all sorts of technical complications for Fresnoy, while his future commissioner, half amused, half exasperated, waits at his table before the audience. In the course of some exchanges Godard answers the telephone, leaving his interlocutors perplexed, in temporary solitude faced with the audience. The interview with Jean Douchet marks the entry of a new sound accessory into the system: a little bell that Godard uses to intervene in the proceedings. He associates it with the anecdote concerning Manet and Degas36 which he will take up again in his exhibition two years later: ‘They ring, and you run.’ He adds: ‘Le Fresnoy has rung, and we run.’ Godard runs indeed, and gets down to work in his own way, brilliant and mocking. Not that he is prepared to do overtime: ‘we’ve done our hour and a half,’ he remarks. The contract is fulfilled and the work done. Perhaps these experiments, rather than creating something, allowed him to understand definitively that he did not want Collages to take the form of video. The project of the nine films gives rise to the complications discussed above, since it is a departure from the programmatic framework of the Centre Pompidou. Godard makes the most of this disruption to attack the institution and to show it how incapable it is of dealing with transgression. In the end, the directors of the Centre approve the film proposition—but it is Jean-Luc Godard who chooses to put an end to it, fearing that he cannot keep up his artistic wager for nine months. At the beginning of 2005, Godard envisaged the Centre as an immense plateau de montage for images and objects, which would extend from the forum to the south gallery.39 A large copy of Rodin’s Thinker40 was to be suspended above the floor of the forum, accompanied by Levinas’s phrase: ‘In “I think therefore I am,” the I of I am is not the same as the I of I think.’ This phrase was to be written either on a laptop computer placed on the knees of the statue, or on his T-shirt. On level -1 of the forum, Godard imagines a ‘Salon des indépendants,’ a projection space featuring a reproduction of Manet’s barmaid alongside a real-life usherette; old and new independent films would be shown. In another space, the seven films made by Peripheria would be presented as video projections, so as to distinguish them from the films in the Salon des indépendants on flat screens. At the entrance would detach Courbet’s The Desperate Man, as a counterpart to Manet’s painting. Further on, a space in the form of a corridor designated ‘Space of the Academicians’ (or for a time: ‘Collabs corridor’) was to bring together photographs of academician film-makers and their films, with a portrait of Sharon Stone saluting the crowd with outstretched arms to welcome the public (this image is present right up to the very last version of Collages de France). Not content with investing the interior of the Centre, Godard sought to take over the whole building by extending his creation to its façade, where he sought to put in place a system of nine panels aligned three by three horizontally and vertically, each adopting the principle of Decaux advertising panels that permit the random rotation of images: ‘Each panel comprises a certain number of photographs, which change according to a rhythm to be defined, on one hand interior to each panel, on the other hand in a discontinuous synchronization with the other eight.’41 The photographs were to be chosen from the history of cinema or from his Histoire(s) du cinéma (mostly close ups of faces or action. Appearing in ever new combinations, these images would create unexpected montages and would recall the ‘little machines that prefigured cinema, but monumentalized in the era of the contemporary advertisement.’42 The panels had the twofold advantage of both announcing the event and being a work in themselves, extending Godard’s proposition to the building in its entirety: ‘The animated “Decaux” panels would be a continuation, according to a principle of gradual transition, of the movement from interior to exterior.’43 In the end, this project would not come to fruition because it proved impossible to achieve nine images per panel, as Godard wished. Whatever the nature of the project, the filmmaker felt cramped at the Centre. Dominique Païni did not share his concern at the restrictive size of the rooms: ‘there is a certain contemporary silliness in matters of art that always envisions things on too large a scale’;44 ‘hollow out, hollow out, hollow out! Not to find more space… But to think again.’45 But Godard could not rid himself of the feeling of being undervalued: for him the amount of square meters allocated was a measure of his artistic status—whence the importance he accorded to money as compensation for what he could not get in space. The acquisition or privation of space is a privileged subject in the messages: ‘is the so-called space 315 of the south gallery definitively out of bounds to “Collages de France”? […] Is the space currently given over to “Africa Remix” also absolutely prohibited in its entirety to “Collages de France”?’46 On the plans, Godard renames space 315 of the south gallery, which he had not been able to secure, as the ‘stolen space’: according to him it is ‘essential to be able to use [it] […] to enlarge the total space currently given over to the nine rooms of the exhibition’ so as to give the whole ‘more impact.’47 He insists on what he cannot obtain or realize, and obliges the Centre to cede to his every desire. Room 7: Here the civil war between image and text must end in peace. But the perfect example is Charlie Chaplin. I saw in Persia a film that has no existence, called Charlie’s Life. Persian picture-shows are given in the open; on the walls surrounding the enclosure sat black cats watching. The Armenian exhibitors had made a montage of all the Charlie ‘shorts’ and done the job with skill. The film ran to a considerable footage and the result was breath-taking. It was the myth pure and unadulterated; it had a huge success. Indeed this room would later be called ‘Myth’ and would retain these primordial elements. If Room A exhibits a situation, a global phenomenon—that of cinema—Room 1 exhibits the first condition of this phenomenon: the entering of light rays into a closed box that provides a point of view on the external world. To which he adds a phrase of Franz Kafka’s: ‘What is laid upon us is to accomplish the negative; the positive is already given.’ Although the imagined device is not yet totally defined, a system of windows opening and closing at irregular intervals is described with some precision. Dummies or mannequins would incarnate the workers. A large wheel (‘reel/master’) spools out a 70mm film overhead, crossing the space onto another large receiving wheel (‘slave’) below. In the remainder of the set, a dozen models of old and modern cameras could be arranged, along with by other boxes (‘shoeboxes, [boîte a bachot], [boîte à boulot], box of tricks ’). Three flat-screen TVs are placed on a table, at which an aged lady sits. Dummies bring the image from the left which she makes pass to the right. Bergson’s phrase ‘Spirit borrows from matter the perceptions on which it feeds and restores them to matter in the form of movements which it has stamped with its own freedom’ is written somewhere in the room; Godard would keep it on the floor of Voyage(s) en utopie. One or two prisoners in a cell. A barred window lets in a ray of light. One of the prisoners, in ragged Napoleonic uniform, is in the process of drawing geometrical shapes on one of the walls. He adds a commentary explaining that this figure is Jean-Victor Poncelet (cited and used by him in the past), author of the Treatise on the Projective Properties of Figures, a text that lies at the origin of the modern theory of projection. This text is supposed to be either displayed or spoken over images. He adds a phrase of Freud’s: ‘the shadow of the lost object falls upon the ego.’ He mentions the possible presence of an actual 35mm projector which would function solely to shed light in the room, not far from a pile of old and modern projectors. Godard mixes drawings of projections with a photograph of Lauren Bacall in To Have and Have Not, as well as Goya engravings on a separate sheet; elements that reprise those of the photomontage published in the MoMa catalogue in 1992. Between a photograph of Adolf Hitler, a fragment of Eugène Delacroix’s The Death of Sardanapalus and the sketch of a projector, Godard describes a royal room in which Caesar and Cleopatra watch his Histoire(s) du cinéma via a video projector installed above a four-poster bed. He annotates it with a phrase from Walter Benjamin: ‘For the sake of what prelude do we cheat ourselves of our dreams? How do we dare carry them into the brightness of day, as we awake?’ Although the room is quite large, he suggests putting in other, smaller projections (of children and videogames, old people, and a pornographic film…). Perhaps two flying cherubs fire an arrow in the couple’s direction. Phrase or voice: ‘the dream of the individual is to be two, that of the state is to be one alone’—perhaps then again the photo of Sophie Scholl and her brother Hans. That the bridge collapses under their carriage is unlikely but I am willing to accept it. That the heroine remains suspended in mid-air over a precipice is even more unlikely, but again I accept it. I am even willing to accept that at that very moment Tom Mix is coming by on his horse. But that at that very moment there should also be a fellow with a motion-picture camera to film the whole business—that is more than I am willing to believe. The same size as room A, this room called ‘The tomb’ is to include on its walls paintings drawn mostly from the classical era (‘more or less well known’ paintings, notes Godard). A great suit of armor adorns the entrance wall: the visor of the helmet opens and closes intermittently to let out a beam of light. The description insists on the variable duration of these illuminations: ‘the moments of light are in a discontinuous rhythm, and last for various intervals.’ During the moments of darkness, a flat-screen TV lights up with the image of Goya’s engraving of an old man. One might wonder just how compelling the full-scale realization of this succession of rooms, more like sets than installations, might have been. The project as a whole betrays weaknesses, even though Godard began by reflecting on the mutations of traditional cinematographic operations (projection, montage…) within the space. Beyond the systems literally reprised from the pre-cinema era (e.g. the thaumatrope), he materially reinterprets certain concepts, as with the projection apparatus in room 3 interpreted on the basis of Poncelet’s drawings and calculations. The spectator/visitor is always at the center of what he imagines: thus in room 4, to make an ‘Antonin Artaud’ sound corridor, he imagines modulating the volume of Artaud’s voice depending on the movement of the visitor (with the sound growing louder as the they approach the corridor). The visitor to Collages de France must be constantly kept awake and must move through each room as a new visual and sonorous experience. Jean-Luc Godard redefined a certain number of notions sketched out in the May 2005 version. The plans, sketches, and illustrations were more detailed than in the first dossier. The exhibition conceived in nine rooms on a 1:1 scale aims to make cinema ‘perceptible’ to a mobile spectator by way of elements that designate it directly—the movie theater, the camera, montage, projection, the film—or more indirectly—murder/the face, uncertainty/countershot, alliance/text and image. The distribution of the rooms and some of their titles are modified. In the filmmaker’s words, the idea is to exhibit ‘the profound elements of a theorem’ and not only a reading of its final mathematical formula; the Centre Pompidou would exhibit the final formula and Peripheria the interior of this formula. a fence with a European flag, around the fence the palisade of an American western fort with the US flag, and then around the wooden palisade the fortified outer wall of Christianity in Jerusalem with its pennants. he is neither magus nor seer but already a priest, and very soon a warrior. Neither poet nor citizen, but already head of state. The filmmaker questions himself on the legitimacy of the annexes in project 2 (the Salon des indépendants, the seven films-studies presented by Courbet’s The Desperate Man, the gallery or corridor of academicians presented by Sharon Stone with her arms raised, as well as Rodin’s Thinker). For him, project 1 exhibits only space (time being prohibited to it), and in this sense is closer to a classical exhibition. Project 3 is inscribed in the ‘reality of the conditions of exhibition in force at the Centre Pompidou.’ Thus, ‘to exhibit, and yet more markedly than in project 2, what as yet exists only vaguely—a very vague new [une nouvelle très vague]—rather than that which has been able to see neither day nor night.’ The principle of this third version is to exhibit the Peripheria studio, reconstituted at life-size. This copy demands great rigor in the reproduction of video and audio material and the library. In this project, the effort is directed not so much toward the exhibition as toward the making of films: ‘Finally, project 3 would allow me to dedicate myself almost entirely to the 7 films/studies, since I would only have to periodically supervise the exactitude of the life-size copy of the Peripheria studio […].’49 Certain spaces still remain indeterminate at the moment this note is written. In one of them, the construction of a large book of Histoire(s) du cinéma is suggested. A replica of the maquette of project 1 made for project 2, but in a smaller format, is also suggested. Godard adds: ‘But this would have rather a the tone of melancholy resentment.’ Quite an accurate anticipation of the way in which he would describe his final exhibition. This second dossier of working documents brings in the possibility of conceiving the Collages de France otherwise, proposing many adaptations to the spatialization of cinema. Backed up by plans and drawings, Godard continues to work on the metamorphosis of his Collages. On the basis of the design dossiers, a great many alternatives were developed for the spatialization of Collages de France. Between summer and fall 2005, Godard produced a large choice of plans, based on the three options from July 2005. Many series, which he named respectively “PR1a–b, PR2, PR3, PR4”, “3 a-b-c-d”, “X a-b-c-c-modified-d”, “Z1, Z2, Z3”—the so-called “Zorro plans”—“Final I, II a-b, III-a-b” appear successively during almost the same period. They may present variants in the assemblage of rooms, but they are principally distinguished by their scale: Godard proposes nine rooms at 1:1 scale, or else a juxtaposition of rooms and maquettes. In addition, some of the plans are centered on the reconstruction of the Peripheria studio at 1:1 scale (described in ‘Le cinéma exilé’), either as a meticulous copy or in a state of ruin (the offices of Peripheria covered with creepers and foliage in a space reclaimed by nature). It is planned that elements of the forum -1 should be reintegrated on either side, in particular photos of academicians and independents. At the end of the summer, the projection of seven films is definitively attached to the south gallery, and the décor homes in on just one space. At first, he refuses to definitively exclude any one of his options: ‘For me, none of the three projects is, for the moment victor or vanquished.’52 But although each of them seems worthy to him, Godard is increasingly firm in expressing his preference for the projects that are no longer at the 1:1 scale, or ‘real’ scale or ‘scale of perception,’ as opposed to the maquette, which he associates with the word ‘imaginary’. after many detours, we find once again all the elements of the initial project: myth-camera-montage (in the studio)–projection (also in the studio)–film (in the form of the 7 studies)–alliance–murder, and even the still uncertain uncertainty (I think of Nietzsche and his writing machine for the blind), and finally the tomb.53 This is followed by variants 3 a-b-c-d and X a-b-c X-c modified, which are all articulated around the Peripheria studio reconstructed identically or in ruins (apart from X a). Plans ‘Z’ and ‘Final’ once again take up the principle of alternation between human scale and reduction. Final I (like Final II) is entitled ‘Collège de France, cinéma exposé ou dé-voilé’ and presents nine rooms at different scales (always with the Peripheria studio in ruins). Thanks to these options, Godard could finally put in place the cinema crew he so coveted, and direct them as he wished. Option 1: We stay with it. I ask for no changes in the agreements or other details. I make the 7 films, respecting the copyright. I send Nathalie all the elements, doubles, originals, variants and additions. I ask only to have the right to put my name to it as I please once the result is obtained by the Centre in March 2006. Option 2B: Nathalie and S. Renaud come together to form a ménage à trois with my set-maker, without the latter having any say in the matter, except to give his views and to keep me up to date with how things are developing. Option 3: The simplest and least expensive. A rather large maquette made by the set-maker and myself, and around 7 rooms of projection for the 7 films/studies, or the film in 7 episodes. Also, at the end, a third amendment taking account of the state of play, with my normal name. Right up to the very last weeks of development of Collages de France, Godard looked to the reduction of scale for a response to his apprehensiveness in relation to the space. Room 2: the image of humanity is given by a text by Schwartz and a phrase reflected in a mirror which has the form of infinity (∞): ‘a curve which is infinite at each of its points, except for one, where it is equal to zero.’ Across from the exit door on a red ground: the figure of Christ with the inscription Ecce homo. Room 4: this room makes reference to the school—in its truant version, following the apartment-class where the protagonists of La Chinoise battle with words—with its benches, its tables, the teacher’s desk, a wardrobe and a shelf with material of projection, as well as the inscription ‘Collège de France.’ The visitor is invited to become a student, while on one of the walls the seven films planned for the Centre are projected. Rather than geography maps, the walls host a large photo of Rossellini, Daumier’s Don Quixote, and the photo of a Nazi meeting alongside that of Sharon Stone with her arm raised. Room 5: four images on a wall, four images on the other wall: ‘and the horizon draws back more / and life grows,’ ‘it’s an matter of agreement / to allow the other to love,’ ‘please let’s die together / a rare proposition,’ ‘one can love someone / entirely real.’ The text on the floor tells of the encounter of Anne-Marie Miéville’s drawings and texts. The phrases are in disorder, it is up to the visitor to make the links between text and image and thus to become active in the spatialization proposed by Godard. Two thaumotrope apparatuses can also be activated by the public. Room 7: a room composed of two mirrors, which allow the exterior (the real) to be reflected within the space of the exhibition.61 A small wooden statue representing Jeanne Hébuterne, model and companion of Modigliani, stands alongside the text: ‘The feeling I have of existence is not yet a self; it is born in me, but without me.’ Alongside this, on a mirror ground, the photograph of Cocteau’s La Belle et la Bête. On a wall, a text by Hannah Arendt. Room 8: A notebook is placed on a table; when it is opened, one discovers a film scene: portraits of couples as well as a phrase of Racine’s from Bérénice; at the end ‘tu es / moi / tuez / moi [you are / me / kill / me]’ On a wall, a painting of David, a photo of Jean Vigo, and images of Lauren Bacall in To Have and Have Not, The Night of the Hunter, and Eisenstein. Also, fragments of papyrus and extracts from the Bible. Levinas’s phrase on the failure of communication in love is reprised on one of the walls. Room 9: In the corridor, a projector is periodically lit and extinguished, intermittently lighting the room. On the floor, a television screen with Goya’s old man, I am still learning. Many paintings run across the room: La Blouse roumaine, Les musiciens, Rigaud’s Louis XIV, a Greco, and a Braque. At the last minute this room is transformed into a chamber, when it had been constituted as a gallery since the beginning of the exhibition. The commissioner wanted to believe that it was now this configuration that would see the light in April, even if some modifications were necessary. Despite numerous differends, the design of Collages de France affirms itself more and more clearly: the project goes forward and takes shape around discords. 1–Maquette 1, presented in a first room, fetishized by the darkness of a room and a precise and precious beam of light falling upon it, haloing it with mystery, with aura, like an element of earth found intact, non lacunary and which transmits to the visitor a feeling of the sacred but also of poetic synthesis, fragile and immanent, the result of an intellectual (and manual!) process. This room would be full of a music that we could choose from among those that have most conferred lyricism to some of your sequences. the maquette of the corresponding room extracted from the maquette number 2 (which would be conceived according to a principle of detachable parts) a large screen of 4.70m x 6.26 m, which would receive a projected image of the same dimensions. The principle would be to associate the real presence of a maquette and the illusion of visiting it thanks to the projection. Since it would in fact be a matter of projecting into each room a visit of each room of the maquette according to the method of ‘reportage intime’ (as one says of the ‘journal’), which you have already used for your first reportage amateur, but which you have told me your intention to remake in a more finished and less ‘amateur’ way. This confrontation within the room of a real object in volume and the projected enlargement of its visit, would give the visitor the occasion of an incontestable encounter with some of what is stake for you in this exhibition. It would basically be to say, that the only, paradoxical, way of passing from ideas to their acting-out in the real is the illusion that cinematographic projection produces. At the same time, it seems to me that we achieve two goals: it is cinema that carries away, that concludes, that demonstrates that ‘only cinema’ is capable of exhibiting a thinking of cinema on cinema, and your films find their integration, at the duration that suits them. In this new proposition, each of the film commentaries will [sic] thus be separated and projected into each room. The drawings made by Nathalie C. on my request and which accompany my proposition, can allow you to see how would be articulated in the space, for the spectator-visitor, an grasp on the maquette and a grasp on the screen (as well as possible, suitable seats for around fifty people simultaneously). Also in this way the point of view of above (on the maquette) would be confronted with the point of view of below on the screen, a confrontation to which, quite rightly, you often return. following your proposal to reschedule the exhibition in question—which we will call EXPO 1—by a few months, and after intense and diverse reflections since our last meeting—on 1/2/2006—we do not wish this nor can we accept it. In effect, all of the “theoretical and practical faults” raised by your representative to Peripheria in his letter of 26/01/2006, all of these ‘faults’ seem to us to have to remain in peril in the house[?? ]—we have not found the film crew requested some six or seven months ago—and this is a quite sufficiently large motive to renounce the report on the fabrication of EXPO 1 at the 1:1 scale on the basis of maquette 2 at 1:25. However, as we have told you on 1st February, we are very desirous to conceive an EXPO 2; the broad outlines have been exhibited to you on the same day […] We lively hope that a new and final agreement concretizes as quickly as possible the fabrication of this EXPO 2 and balances the accounts of EXPO 1 (7 films and a maquette 1+2+3) clearly for the two currently co-productive parties. Toward the end of our visit to ‘Voyage(s) en utopie’, the elliptical rough draft of the original Godard exhibition at Centre Beaubourg which, in the end, never happened, Godard talks about cinema in terms of the chameleon. We stand before an old Russian film. A peasant looks at an ear of corn, slowly, for eternity. He looks at it in the same way that Godard would, no doubt, like to look at cinema: last screening, first harvest, the first time forever, marvellously slowed down, lost and recovered from childhood. It’s a Tuesday and the centre is closed. The film maker has shut off the sound, which is usually rather loud—so loud that he had to negotiate with the occupational doctor and install an anti-noise curtain at the entrance to protect the attendants, on medical advice. At first the curtain was made of thick gray slats. Now it is transparent. As in his films, the sound is made up of very precise sounds of speech and noises which fade up and mix together in a sort of intimate cacophony. ‘I wanted the ambience of an open-air dance [bal musette]’, he tells me. ‘When I need it or when it makes me think of films. My favourite is Ornette Coleman. Even more, I like that, at one of his first concerts, they told him: “It was better before”’. Today, he has cut the sound so that his assistant can film us as we talk: adding yet more traces to this space full of traces. The traces are not just memories; they are sketches, platforms; they call the others to work. A replica of the Rosetta Stone features in the last room. Only a Champollion could or would wish to decipher Godard. He seems to feel he is alone and powerful, like a pharaoh preparing his funeral barque. Often, he smiles. The last phrase you see on leaving the exhibition is: ‘The black book of the reverse-shot [contrechamp]’. For Godard, the chameleon is the death of the reverse-shot. An animal that adapts itself, that swallows and gives back nothing, or only silence. On the walls of the three rooms of ‘Voyage(s) en utopie’ there feature not only TVs, upon which are looped scraps of the films that have made him, or that he has made, or that propagate a world which, according to him, is in the process of unmaking itself. There are also, between the debris of the sets or within them, and perhaps most important of all, sentences. They are typewritten on scraps of paper, written on pieces of wood or inside the maquettes that show what the exhibition was supposed to be, or else traced in marker pen straight onto the wall or plated in stiff capitals on the floor. Godard sometimes comes back to the same place and adds a few words. In room 1, ‘Today perhaps [Aujourd’hui peut-être]’, on entering we read these words of Degas, when he learned of the invention of the telephone: ‘I see, so you ring it and you go there!’ Later, on scraps of wood, Godard added: ‘Worse: you are already there’; ‘Worse still: you say “I’m not there”’. Further on, a small reproduction of, Giacometti’s statue The Walking Man—without a caption, as always. Godard has simply added ‘I don’t walk/work [je ne marche pas]’. Degas was a misanthrope, and Godard is too. Alceste, but with more humour and levity, but more histrionic too, as if, even so, life deserved to be lived, played out, manipulated, even in company. The phrases are not strewn randomly. They echo one other. Through clues they mask or signal their origins. Everything, here, plays with the public’s curiosity: in this scaffold of projects, in this house of destroyed puppets, one always feels a little like the last visitor to the last exhibition of the last film-maker in his last years. Everything has already been written, filmed, and one is left to decipher the vestiges. Which makes one feel at once fortunate and disgruntled: Godard regrets an exhibition that he has probably made entirely so as to be obstructive. He plays with his glory and his failure. Never are the inscribed phrases, or graffiti, so to speak, directly attributed to their author. On passing the entry curtain, one immediately discovers the following, dated 1953: ‘Finally, the american man will deploy himself upon the immense screen of our dreams in the full extent of his actions’. ‘It’s Truffaut,’ says Godard with a grimacing smile. And, not without a certain pleasure, the grimace is accentuated. America is everywhere in the third room, the room of Black Hawk Down, of the world today. It begins at the entrance, on the right. On a screen, a scene from On the Town, Stanley Donen’s first film, dating from 1949. Sailors Gene Kelly and Frank Sinatra dance with women in front of an elevator which closes on them. The joy and movement are explosive, illustrating the phrase that Godard attributes to Truffaut. But what surrounds the scene in this room provokes a certain melancholy. What has been lost, Godard seems to be saying, is quite simply surprise—the splendid fatality of the moment. Cinema, like women, deserved crazy love, l’amour fou. Godard’s memory often deforms the phrases he cites. It has digested them in its own way and he has the senstitivity—and it is indeed sensitivity—not to check them. Sometimes one recognizes a man who is cultivated in the types of errors he commits: they belong to his natural character. His knowledge is that of a walker who here and there picks flowers which his sensibility, his memory, his dreams, and sometimes his resentments collect into a more or less final bouquet. In Godard’s memory, there is the memory of ‘Anne-Marie’—Anne-Marie Miéville, his wife. She is not there, but she often appears in the conversation. And it is a pleasure to hear a man pay homage to the woman he loves by sending her, in her absence and through an mediating interlocutor, announcements of recognition and admiration. A little before the end of the exhibition, Godard has placed this phrase of hers: ‘It is a matter of understanding to let the other love.’ Lovers feel alone, and this is why they love. This is not psychology; it is the energy of the dream to the point of destruction. Godard has always been good at filming women. He also speaks well of actresses: today, for example, of Kim Novak: ‘A little apple, a little pear, a little modelling clay’. He likes her best in The Man With The Golden Arm. Godard smiles. The smile is a trenchant half-moon, dolorous and wily. It is not without tenderness. Nor without mischievousness. It strains to illuminate a destroyed landscape—that of cinema, and of the consciousness of the world that it seems to sign. The clouds are gathering and it is up to each visitor, as it is up to every viewer of his films, to imagine what they hide and what they link together. This is the meaning of the first… slogan? Sentence? Maxim? …that we see even before entering the exhibition: ‘What can be shown cannot be said’. With Godard, visiting the building site of the exhibition that never was, we are in the land of jansenism: everything is hidden, everything is past, everything falls. But we are not only in the land of jansenism—or else, we are there like Pascal: pleasure and play are part of the journey. The Provincial Letters whips up the melancholy. In front of the window, a small electric train passes by. There are two tracks, but it circulates on only one. Its wagon bears oranges, bananas, one of Godard’s cigars, and a tennis ball. Through a tunnel carved out of the wall, the train comes and goes between this room and the third and last, that of ‘The Day Before Yesterday [Avant-hier]’. On the ground, scraps of apparently incomprehensible phrases are arranged between one room and the other: ‘Spirit borrows’ ‘on which it feeds’ ‘stamped with its own freedom’. A little book nailed along the train track gives us a clue: Bergson’s Matter and Memory. One must circulate, ‘come and go’ along with the train, in order to piece together the puzzle. The original phrase is: ‘Spirit borrows from matter the perceptions on which it feeds and restores them to matter in the form of movements which it has stamped with its own freedom’. It is the motto of this exhibition: that which has been borrowed must be restored in the form of movement, and it is in this way that one may perhaps become free. Deleuze read Bergson. Godard read Deleuze. Perhaps Godard read Bergson. Now he kneels at the end of the railway, on the ‘Avant-hier’ side. The train approaches. He leans over the text that features under the arrival of the train. As usual, he has barred out some passages to reveal just one. In this text Sartre speaks of the dialectic. Godard begins to read in a loud voice while the assistant films: ‘A dialectical thought is first of all, in the same movement, the examination of a reality in so far as it is part of a whole, in so far as it denies this whole, in so far as this whole contains it, conditions it, and denies it…’. The remainder of the text becomes increasingly intoxicated with its figures, and Godard eventually stops reading. In the middle of this last room, we find the maquettes of the exhibition that was to be. Inside them, phrases, devices, books. Unattributed verses from Lamartine (‘Bring back peace and love to the breast of my exhausted soul’), Verlaine (‘Let’s die together shall we? The proposition’s rare.’) How are these clues thrown out? Not randomly. An example: this nailed down book by Frédéric Prokosch, Hasards de l’Arabie heureuse. Godard has read it; it made him think of a phrase of Griffith’s: ‘We must call cinema the eternal Arabia’. We are in the maquette entitled ‘Myth (allegory). Hollywood, the Mecca of cinema. Mecca, America, September 11th, Disaster, chameleon, Godard.’ See the exhibition and guess the rest. We don’t want to give an exegesis of the holes he has dug: it is up to each visitor to enter into them, alone and without any instructions. On the left at the exit, three paintings: a copy of Matisse’s La Blouse roumaine, the original of which hangs five floors above us, a painting that Godard saw in a book as a child; Nicolas de Staël’s Jazz Players, grasped in their verticality, floating stiff between figuration and abstraction; a third, unrecognised, abstract painting. He takes a marker, kneels, carefully corrects the text—and it is as if suddenly the exhibition, at last, belongs to those who visit it, whoever they may be. Suzanne Schiffmann, ‘Le Saut dans le vide: une interview de l’alpha-scripte, Suzanne Schiffmann,’ remarks collected by Michel Cournot, Le Nouvel Observateur 25 (May 6, 1965), 29. ‘The famous “salto mortale” which Gelsomina smiled at, faced with the commissioner attacked with acid,’ wrote Godard of the leap to the 1:1 scale the commissioner was encouraging him to make, e-mail summary, February 2006. E-mail from Jean-Luc Godard to Dominique Païni, March 1, 2005. Here we give only a selection of the configurations of the rooms. In reality there were far more options proposed, but the names used are limited to those mentioned above. Gilles Deleuze, ‘The Exhausted’, in Essays Critical and Clinical , trans. Daniel W. Smith and Michael A. Greco (Minneapolis: University of Minnesota, 1997), 152–174: 152. Jean-Luc Godard, ‘Collages de France. État du travail d’études pour l’exposition. Premier rapport approximatif, mai 2005’, [no definitive reference to this given in the notes provided] 31. Email summary [courrier-bilan???] by Jean-Luc Godard at the Centre Pompidou, February 2006. E-mail from Jean-Luc Godard to Dominique Païni and Nathalie Crinière, June 27, 2005. E-mail from Jean-Luc Godard to Dominique Païni, December 23, 2005. E-mail from Dominique Païni to Jean-Luc Godard, January 5, 2006. E-mail from Jean-Luc Godard to Nathalie Crinière and Jacques Gabel, December 29, 2005. Interview with Jean-Luc Godard by Olivier Bombarda and Julien Welter for the Cahiers du cinéma website, [no reference given in notes provided]. E-mail from Dominique Païni to Jean-Luc Godard, October 4, 2005. E-mail from Jean-Luc Godard to Nathalie Crinière, September 26, 2005. It is in similar terms that Henri Langlois’s museum [the Musée de la Cinémathèque in Paris] would be recognised in 1997. Emmaus is the recipient of failed projects: at the time of his (abortive) collaboration with the TNS, Godard had suggested to the students who did not respond to his invitations to read and to film, to take their cameras to the Compagnons d’Emmaus; an anecdote recounted in the interview with A. Bergala, ‘Un Boucle bouclée: Nouvel entretien avec Jean-Luc Godard par Alain Bergala’, Jean-Luc Godard par Jean-Luc Godard, ed. Alain Bergala, vol 2 (Paris: Cahiers du Cinéma, 1985), 19. This idea of an exhibition of original works would come back later in the room entitled ‘The Tomb’ in which Godard arranges a portrait gallery. Note by Jean-Luc Godard, 2002, personal documents of D. Païni. Jean-Michel Frodon, ‘Dominique Païni, une saison avec Godard’, Le Monde, April 7, 2003. Vrai faux passeport could be the filmic testimony of what this televisual visit could have been: an end-to-end without transitions. E-mail from Dominique Païni to Jean-Luc Godard, September 2004. Godard himself makes this comparison: ‘Le Fresnoy is only a distributor. It has access to copyright, it has purchase rights for a reality TV show that is not Star Academy but the Peripheria studio.’ Jean-Luc Godard, ‘Ensemble et séparés,’ interview with Jean-Douchet [reference needed–full reference not given in notes provided]. In particular, the episode on ‘Marcel’ takes the time to show the man at work, at the factory and at home in his practice as an amateur filmmaker. The episode entitled “Y’a personne’ stages false job interviews. Godard, out of frame, interrogates non-professional actors on the gestures of their metier and the sense of the exercise of the filmed simulation of a job that they are carrying out. Jean-Luc Godard, ‘Travail-amour-cinéma,’ La Nouvel observateur 832 (October 26, 1980). A film a few minutes in duration, Faut pas rêver. Quand la gauche aura le pouvoir shot by Godard in 1977, shows a small boy immobile in front of a television, which is out of frame but whose clamour we can hear on the soundtrack. The film ends with the title: ‘When the left is in power, will TV still have so little rapport with the people?’ Is such a rapport even possible? In any case, television is one of the privileged spaces of the Godardian utopia. ‘Room 666’, a series of films made by Wim Wenders in 1982 at the Cannes festival: he invited film-makers to set a camera and a tape recorder running in room 666 of the Hotel Martinez, and to respond to a question about cinema. Jean-Luc Godard, ‘Le cinéma ment, pas le sport,’ interview with Jérôme Bureau and Benoît Heimermann, in L’Équipe, Wednesday May 9, 2001, 9. Jean-Luc Godard, ‘Ensemble et séparés’, interview with Jean-Douchet [reference needed]. An favourite image of the film-maker’s, which appears again in Histoire(s) du cinéma (‘Une vague nouvelle’), King Lear, Dans le noir du temps, in a collage for issue 300 of Cahiers du cinéma, in Collages de France, Voyage(s) en utopie…. This drawing of Goya’s, entitled Aùn apreno (‘I am still learning’), a phrase attributed to Michaelangelo) was made at the end of his life, when he discovered lithography. One can easily imagine how the aging Spanish painter may have identified with this representation. The image is used recurrently by Godard from 1987 onward, almost always along with a flame. The assemblage of drawing and flame produces an autonomous work of which Godard becomes the author: in JLG/JLG, Goya’s image is absent, but the flame lit for the filmmaker’s cigar in the darkness is enough to make the memory of it spring forth, in so far as the staging (Godard appears both at the beginning of the shot and on a screen where he is filming himself ‘live’) literally creates a filmed self-portrait. The image functions as an inverted vanitas: to still be learning is to battle against death, to hold back the moment when the match or the candle will be entirely consumed (according to the traditional pictorial representation): the dying light of an old man with a curved spine, certainly, but also the light of intelligence and invention which persists and resists the degradations of time. Unlike an immobile vanitas, the video capture animates and prolongs the life of the flame: cinema becomes the guardian of the light. On a wall in the room ‘Today,’ he writes, ‘Around 1900, C. Monet invited E. Degas to come and see the telephone that had just been installed for him. I see, says Degas: you ring it and you go there!’ These words are placed alongside two wire characters holding portable telephones[?]. Jean-Luc Godard, ‘Ensemble et séparés’, interview with Jean-Claude Conésa filmed in Rolle and Le Fresnoy, Autumn 2004. E-mail from Dominique Païni to Jean-Luc Godard, October 12, 2004. The information above on the organization of the exhibition spaces comes largely from the ‘Premier rapport approximatif’ on Collages de France, made by Jean-Luc Godard in May 2005. A copying procedure that Nam June Paik had already carried out when, in the 1970s, he staged the sculpture of the Thinker facing its image reproduced on a screen in TV Rodin. Jean-Luc Godard, ‘Collages de France. État du travail d’études pour l’exposition. Premier rapport approximatif, mai 2005’, 2. E-mail from Dominique Païni to Jean-Luc Godard, July 2, 2005. Jean-Luc Godard, ‘Collages de France. État du travail d’études pour l’exposition. Premier rapport approximatif, mai 2005’, 34. For our descriptions of the various versions and development of Collages de France we have relied principally upon the dossier presenting and reflecting on the project, entitled ‘Collages de France. État du travail d’études pour l’exposition. Premier rapport approximatif, mai 2005’, along with another similar, more detailed document dating from July 2005: each of these dossiers contains sketches, designs, photocopies of reproductions of paintings, films, and photographs, and written and typed texts relating to the project. E-mail from Jean-Luc Godard to Dominique Païni and Nathalie Crinière, July 3, 2005. E-mail from Jean-Luc Godard to Nathalie Crinière, July 23, 2005. E-mail from Jean-Luc Godard to Nathalie Crinière, July 11, 2005. Here Godard cites a phrase of Léon Brunschwicg’s. E-mail from Jean-Luc Godard to Dominique Païni, July 25, 2005. E-mail from Jean-Luc Godard to Dominique Païni and Nathalie Crinière, August 10, 2005. E-mail from Jean-Luc Godard to Dominique Païni, October 25, 2005. E-mail from Jean-Luc Godard to Dominique Païni and Catherine Sentis, December 17, 2005. E-mail from Jean-Luc Godard to Dominique Païni, December 22, 2005. Apart from the works cited, other titles to figure in the exhibition were mentioned: Principles of Tragedy (Racine), Humiliated Children (Bernanos), The Ebb-Tide (Stevenson), The World as Will and Representation (Schopenhauer), Albertine Gone (Proust), On Certainty (Wittgenstein), I Am Legend (Matheson), Notebooks for an Ethics (Sartre). The porosity between interior and exterior is preserved in Voyage(s) en utopie: outside of the south gallery, Godard affixes Bazin’s ‘robe sans couture’ (in Matisse’s clothes) and uses the transparency to integrate the reality of passers-by and the tents of the homeless into his work. The architecture of the south gallery allows him to frame and to absorb pieces of the ‘real’: with no discontinuity, the urban temporality of the city flows behind the glass. Written proposal from Dominique Païni to Jean-Luc Godard, January 26, 2006. Proposal by Dominique Païni to Jean-Luc Godard on January 26, 2006, first version (passage absent from the version faxed to Jean-Luc Godard). E-mail from Jean-Luc Godard to Dominique Païni, January 27, 2006. E-mail from Jean-Luc Godard to Bruno Racine, February 7, 2006.